Believing the myths about home cooling can lead to higher energy bills. Here in Las Vegas, the hottest months of the years are typically also the most expensive. That’s because we have to rely on our air conditioners to combat the desert heat and keep us cool. Unfortunately, much of the advice out there on how to save money while staying cool is based on myths, and if you follow it, you’ll likely end up with even higher energy bills. That’s why the air conditioning service experts at Tippetts Mechanical are here to debunk the common myths about cooling your home. Myth #1. To save money, keep the temperature consistent in your home at all times. Many people believe that it takes more energy for an air conditioner to kick back on and adjust after it has been turned off or set to a higher temperature, so they keep their home at a consistent temperature all the time, regardless of if they are home or not. This will just end up with you paying to cool an empty home, and it’s much more efficient and cost effective to program the thermostat in your home in conjunction with your schedule. Myth #2. You’ll save more energy if you use a fan. This myth is actually partially true, but it’s also misleading. Turning on the fan can help you stay cool, but it won’t actually change the temperature in the room, so your air conditioner won’t automatically adjust when you have the fan on. The air movement generated by the fan won’t actually make your home cooler, but it can make you cooler, which means that you could get away with setting your thermostat a few degrees higher when you’re using a fan, helping you to reduce your reliance on your air conditioner. Myth #3. As long as cold air is coming out of your unit, you don’t need to think about it. Most people don’t give a second thought to their air conditioner until it stops working, but you shouldn’t just ignore it until trouble arises. In 99 percent of cases, air conditioning problems can be avoided with preventative maintenance. 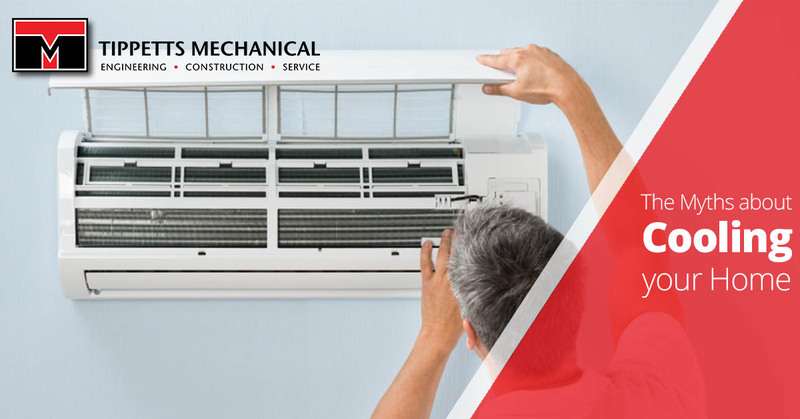 Additionally, properly maintaining your air conditioner can extend its life and make it more efficient, saving you money on your energy bills, as well as on premature air conditioning replacement. Myth #4. When it comes to air conditioners, bigger is always better. While it’s true that the size of your air conditioner can make a huge difference in its efficiency, that doesn’t mean that bigger is better. In fact, it’s essential to have the right size for your home. If the unit it too small, it will have to work extra hard to keep up with the cooling demands in your home, and if it’s too big, you’re likely to experience frequent short cycles, which is when the unit turns on and off throughout the day, preventing it from properly cooling your home. Don’t let the myths about home cooling lead to higher energy bills. Turn to Tippetts Mechanical for the professional service and information you need for your air conditioner. Contact us today to get started.